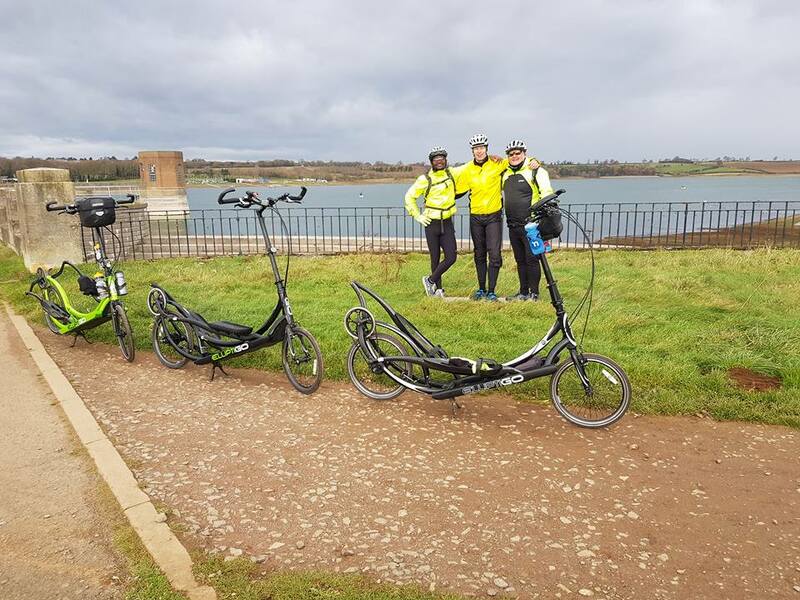 Paul Hunt has been kind enough to share his first month of ElliptiGO training, which is a great way for the average person to understand the typical journey of a new ElliptiGO rider, starting out for the very first time. Paul is a chef and he runs a food company based in Northamptonshire. Going on the name of his food company (The Skinny Chef) I guess he really wants to be skinny! He weighed 17-stone at the beginning of his ElliptiGO training journey and had been diagnosed with type two diabetes. 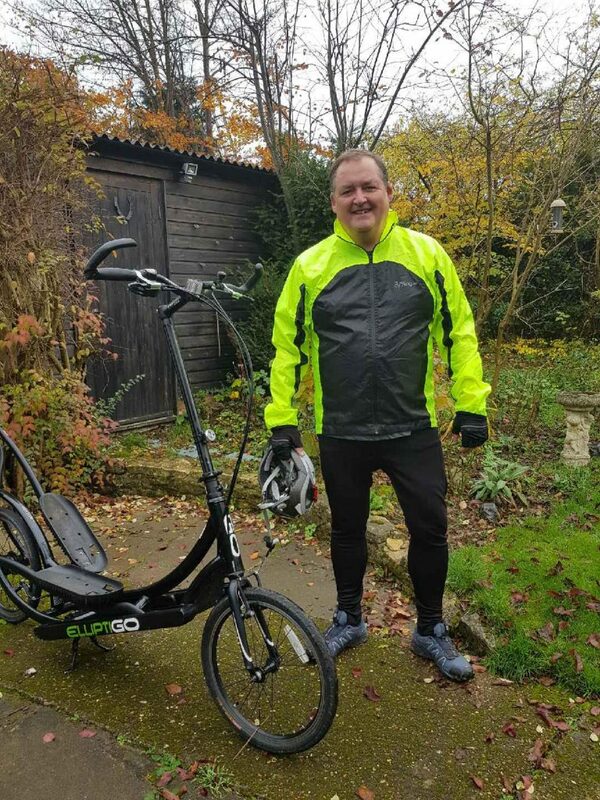 So Paul got himself an ElliptiGO 8C bike in October 2017 to turn his health around and he has shared his insights and initial experiences with me as he begins his new fitness and weight loss journey. 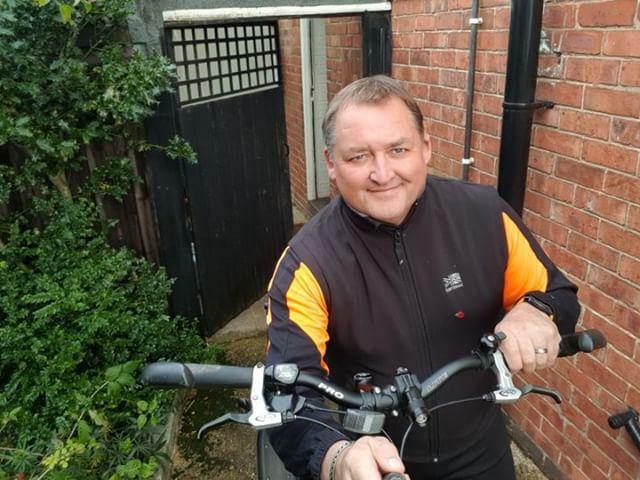 Paul has set himself the ultimate goal of reversing his type two diabetes diagnosis (much in the same way as ElliptiGO rider Paul Cooper did, earlier in the year) by eating healthily and exercising regularly. 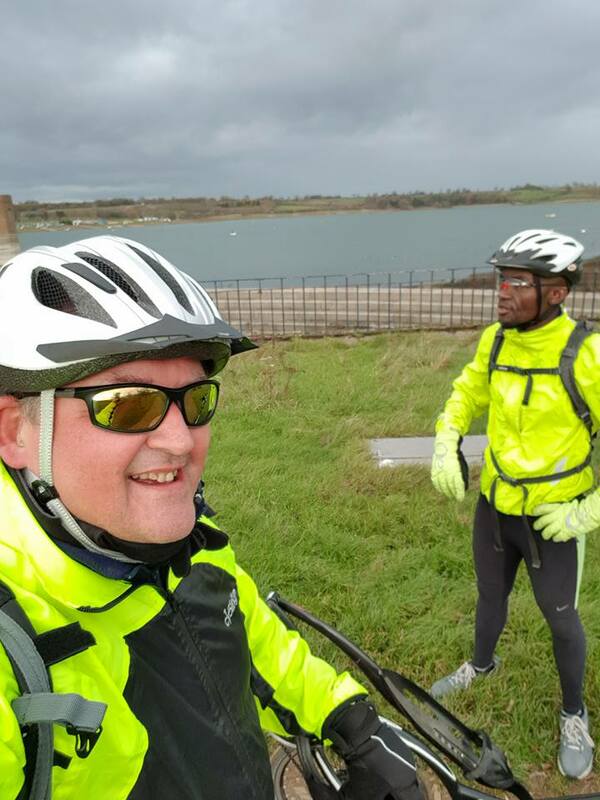 I’ll be giving Paul some direction, support and advice on his ElliptiGO training – and also connecting him to people (such as Paul Cooper) whom I think can assist with his training and weight loss goals – but this article will mainly focus on covering his first month of ElliptiGO training. Well I’ve just got back on my first proper ride. It was interesting and allowed me to make adjustments to the bike. Firstly, I had a little too much weight on my wrists, so I raised the bars 1 notch – and this allowed me to stand up straight (taking the weight off my wrists). The route I took was from Northampton to Moulton village (through to Boughton village and back into Northampton). Although a short journey it takes on plenty of hills – which is where I learnt my second lesson – take the highest gear you can, otherwise you find your self peddling at high cadence and puffing yourself out! Lesson no 3: people are interested – and they sometimes try and stop you to chat – which is nice, but ultimately it slows you down! Paul you’re doing great. I see no need for additional feedback at this stage – as the first week should be about building familiarity with the bike and skill development, rather than hard-core focused training (you can see more of my specific tips and important advice for new ElliptiGO riders here). Well, week two has come around really quickly and I have been experimenting with the bike set up – including my riding style. I have the handle bars at the highest point, enabling me to take the weight off my wrists, which makes it easier for flat roads and also going down hills. I went out on Saturday for my first ‘proper’ dark morning ride. 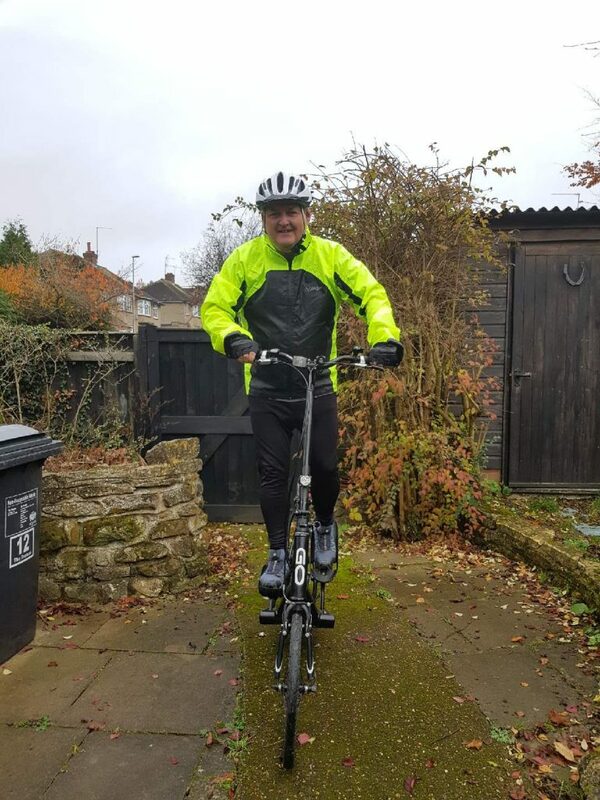 Having got up at 6am and added extra lights to myself (rather than the bike – with the addition of 2 lights to my helmet and two front lights – plus the high viz jacket and flashing arm bands) I looked more like Darth Vader than an ElliptiGO rider! After a hot cup of fresh ginger & lemon tea – and a banana – I was ready for the off. My ride took me through Bradlaugh fields and onto Moulton village, following a similar route as my first “big” ride. I went through Boughton, on to Brampton and back into Northampton. The roads were quiet and it was nice riding in the dark. I didn’t see much traffic in the country, but as I approached town daylight started to come through and it was turning out to be a bright windy morning. This was a challenge, because of the riding position you can’t hide from it, so it was quite relentless and slowed me down considerably. I tried crouching down to make myself smaller, but it made the bike very twitchy (once I get a little more practice it’ll come easier) but on the plus side, when you are riding with the wind its like someone is pushing you from behind! I have used the bike nearly every day, using it for small errands, but I find myself going the “long” way home with rides taking in a bit of traffic and honing my slow filtering skills (this is where you get noticed the most by other road users – but most of all it’s about smiles and generally positive comments). The shortest of these rides was around 1 mile long and the longest was around 6 miles long. The ElliptiGO bike uses different muscles from a conventional bike, so I’m tiring earlier than I do on a road bike, but I am feeling stronger the more I ride. *I still haven’t brought bottle holders yet, so this is next on my list. *Plan longer rides. At the moment this is time-dependent, but I should start getting a bit quieter with work. *Get my average speed up. Although not more important than doing the miles! I’ve lost 7lbs and I feel great for it! Keep up the good work Paul – and keep doing what you’re doing. Be sure to keep building your bike-handling skills and always err on the side of caution when it comes to any riding maneouvres. And keep watching your food and calorie intake. Another useful tip for rides that are done first thing in the morning is not to eat, or take in any calories, before the ride. Just drink a lot of water (750mls to 1 litre) and then GO for the ride. Try it cautiously over a course and distance that you’ve ridden comfortably before and see how you get on. Then eat immediately after getting back home (but first fill up on water (again 750mls to 1 litre) before you eat. The water takes up stomach space and ensures you don’t overeat in the post-ride meal. The practice of ‘fasted riding’ which I’ve just described is an ideal way to avoid loading up with calories immediately before your morning rides and then again immediately afterwards (which can work against the weight loss goals because that’s actually encouraging the consumption of more calories than you’d eat if you were not exercising). This fasted morning ride approach is by no means mandatory, but I have found it a really easy way to address that problem of calorie-balance for weight maintenance or weight loss. For reference, I have done rides up to 200-miles long without eating first thing in the morning, so I know that over normal training distances there’s no risk of running out of energy on a fasted ride at a moderate or light intensity. Just ease yourself gradually into the practice to gain the confidence first – and you could find it a useful tool for your weight loss and exercise journey. I had a great ride on Saturday and broke the 20-mile mark (22.2-miles to be precise!) and had a very sunny, windy ride onto the Bedford Road (via Horton village) where I spoke to one of the residents who actually said he has seen you (Idai) numerous times, riding through the village on a bike just like mine! Riding past the Braifield Banger Racing Track a car almost had me fall off my bike, because he came past me so close (and fast) that he almost took my breath way (Editor’s note: quite literally!). But with a wobble (and veering onto the verge) I managed to stay upright. This was pretty odd, really, because on the ElliptiGO you stand so tall (and with my high-visibility top I’m not exactly invisible)!!! I then crossed over the Bedford Road and dropped into Billing, from Braifield (and onto the cycle path that skirts the A45 dual carriageway), then over the footbridge to the bottom of Rushmere Road in Northampton. This road is always near the end of my ride and is my ‘nemesis’ (on my road bike it kills me – but on the ElliptiGO it killed me even more)! However, I got to the top without stopping! I got home exhausted – but I felt really good. I am getting more and more confident, especially when making hand signals for turning (in fact I have no concerns, I’m riding like a ‘pro’ now). I think my pacing is getting better now. In fact, when I bought the ElliptiGO 8C I thought that maybe I should have gone for the 11R instead (fearing that I wouldn’t manage the hills on the 8C or that I would need more gears). But at this moment the 8C is still far ‘better’ than my fitness level needs, so I have a lot of miles left on this machine, before I consider an upgrade! Best Ride Distance so far: 22.2 miles. Weather: partly sunny (Editor’s note: I can see the ‘half-full’ approach creeping in as you GO out more regularly – last week it was ”partly cloudy’)! On the day after my longest ride I did a cruise around town on the ElliptiGO, just to check if my legs were still working! And I felt good! All in all, a pleasant ride. I notched up 7.6 miles in the process, without even trying too hard! I still haven’t brought bottle holders yet, got to get my act together. I must keep the momentum GOing! Perfect progress – and I am glad you’re still with us! 1. For the coming week it’s worth looking at positional awareness, just to avoid incidents like the dangerous ‘boy racer’ who ‘close-passed‘ you (which, by the way, is actually illegal to do – because UK law requires a minimum of 1.5 metres when passing a cyclist or pedestrian). In cycling, many people feel insecure about asserting themselves on the road. But if cycling is your chosen mode of transport, or long-term exercise, the main aim is to be able to do it for the rest of your life. And you want that life to be a long one! So be sure, whenever you hear vehicles approaching from behind you, to look back and then to position yourself further into the lane, in order to force a wide overtake. The first few times you do this it may need some extra confidence, but what you’ll notice is that cars will pass you much wider if you take a more central lane position as soon as you notice them approaching. And they will generally pass you with more space than they would if you had stayed closer to the road edge. Something about asserting yourself subtly on the road draws the attention and response of most motorists. Also, if a car is coming towards you do exactly the same thing – first look back (to see if another car is rushing up behind you) and then assert yourself towards the centre of your lane. This discourages the cars behind from trying to squeeze past you at speed when there’s also an oncoming vehicle. This is actually the most risky road scenario – an oncoming car approaching, because there is nowhere for the car coming up behind you to go of it passes you at the same time as an oncoming car. So don’t tempt ‘close-passing’ by leaving just enough room for bad drivers to think they might get past you. And don’t wait to find out if the guy approaching you is a good or bad driver, just get used to doing this lane assertion naturally (and without thinking about it) because it only counts for the bad drivers out there (and they are hard to spot -until they actually force you off the road – or worse)! My last point related to road positioning (as it is such an important aspect of safe riding) always ride at least half a metre from the road edge. Riding along the edge of the road is a danger to yourself – and to other road users – and is actually regarded as dangerous riding. So don’t get into the ‘novice cyclist habit’ of trying to give passing motorists as much room as you can, because they must only pass you under the same circumstances that they would pass another car (with a clear long distance view and also a clear lane ahead). You can easily get caught in cracks and uneven road edges if you ride too close to the edge of a road – and you have a serious fall as a result (which may throw you into harm’s way and could even cause a ripple-effect on other road users, who are trying to avoid a falling cyclist). These positioning skills are essential for all riders, regardless of the bike used. So don’t think that just because the ElliptiGO is new to you it is necessarily new to all the passing road users in your area. As you are aware, quite a number of ‘us’ use those same roads you mentioned on weekend mornings – and those ‘boy racer’ drivers may already be familiar with the handling characteristics of an ElliptiGO (meaning they will give it no more regard than any other bike)! I personally cannot count the number of times myself and a couple of my training buddies have used the same roads you describe (and as you later mentioned in your report – some of the locals actually alluded to having seen us). So never assume your added visibility on the ElliptiGO ‘intimidates’ all the other road users. Just play it safe and do the same as you would do when riding a road bike, to stay safe and visible. Regarding the big hill, well done for scaling it. A good ‘trick’ to be aware of when using the ElliptiGO on hills is not to rush it. GO up as slowly as you possibly can because the bike – as you know – balances really well, even at speeds slower than walking. So use the lowest gear you have available and GO up at the slowest pace you can confidently manage. Use your weight to push the pedals down, by almost lifting up the returning leg with each pedal stroke, so that all your weight is only ever pressed onto the foot that is pushing downwards (this is not obvious to many ElliptiGO riders, but it makes you much more efficient in certain circumstances to deliberately ensure both feet are not weight bearing). I use the ‘foot-lifting’ technique that I just described for riding longer distances and it really reduces the buildup of fatigue. Many ElliptiGO riders will always apply pressure on both feet (meaning they exert downward pressure, even on the non-driving foot, when they ride). This gives added bike stability when pushing harder, and generally gives you a tougher workout, but is highly inefficient. So it’s great for fitness training, but if you are not confident in finishing strongly in a hilly or long ride, then you might want to play it safe and save energy under certain circumstances, just to make it a more pleasant outing. Save the highest training intensities for when your fitness is peaking. For these first few weeks focus more on enjoyment and avoid over-doing things. It is great to hear your signalling has developed so well. At this point do not become overly confident. In my experience, most new riders continue to improve their balance and stability for at least 3-4 weeks on the ElliptiGO – and some need even longer to genuinely perfect it. So always err on the side of caution in the first 4 weeks and never feel overly confident on any bike, as that’s sometimes a recipe for an accident. Even when you know you can handle a particular maneouvre, rather than test your limits, be cautious. It’s okay to slow down or lose pace, just for added safety. So don’t get the common ‘cycling training disease’ (behaving as if you’re in a race all the time), which many people new to endurance training are susceptible to. Remember – you don’t know what you don’t know, in any new field. So caution is never misplaced as you start out! Your pace is coming along well now, but always be aware that it is unlikely to optimise in anywhere under 6-months. So where you are now is still ‘baby steps’ in the greater scheme of your potential and you must look at it that way, or you’ll become complacent and aim lower, thinking that you are already doing well. There is nothing as amazing as the human potential, so be prepared to surprise yourself in the next 12 months! And yes, be sure to get a good water-carrying system, if that’s bottle holders or a backpack. You will not progress well if you cannot optimally hydrate yourself during some rides. Also remember to drink a lot of water just before riding – and also just afterwards. Drink before you eat at the end of the ride, to fill up stomach space and to help kill your post-training appetite. Personally, I try to drink up to a whole litre of water as soon as I walk back into the house, after training. Then I look at preparing my food! That gives my mind time to settle down and especially gives my mind time to get over the false urges to overeat which can often occur just because I have exercised. Remember, exercise can’t beat a bad diet – ever! I am 10lbs lighter than I was at the start, so moving in the right direction! I get everything you say regarding the positioning on the road and expect no favours! By and large, most people are respectful, but you cannot legislate for stupidity – so I’m always on my guard! Great to hear this Paul. I assume: “10lbs lighter than before” means 3lbs lost since the previous update? If so you’re perfectly on track. In the 1st week 5-7 lbs is not uncommon during a weight loss programme. But longer term the standard is around 2lbs per week for a fat-loss plan. Much more than 2lbs a week is probably not realistic to aim for in the longer term, so it’s a bit like riding up hills when you’re working on your weight loss (in that pacing is still key)! Week 4: Paul’s (FINAL) Report! My last ride went to Wellingborough (where I had a cuppa) and then back the same way I came. The first part of the ride was mainly uphill, but this didn’t really cause me too many problems, it’s all about picking the right gear and sticking to it. The novelty of being a bit different is still apparent (from the many inquisitive looks I get) but I’m getting used to it now! Coming back home was a challenge – I was losing light. Also, a hail shower hit me and was followed by a brief heavy shower, then the skies opened to what was a clear but chilly interlude. But I was so hot (because of the riding) that it didn’t really matter – and my Lycra leggings soon dried out. What is really noticeable now is my ability to keep a steady pace when going up hills – and there isn’t a hill that I have been beaten on yet (but I’m sure that will happen at some point)! To be as regular on the bike as possible (I’ve had a busy time of it at work and don’t want it to be the reason why I am not using it enough). Finding other ElliptiGO users to train with (and not holding them up)! Increasing my average speed and distance. Get bottle holders. I still haven’t done it yet – yikes! Great feedback Paul. I took a bit longer to get back to you because this will be my last (so, most important) message in the ‘series’. I’m almost sad that our journey has come to an end (with these weekly emails) but in truth your journey has now really just begun! And we will remain in touch and take things forward, step by step. Your progress has pretty much been ‘textbook’ Paul. You should be pleased with where you are and you are building a decent foundation for the future. Regarding your ride feedback, it is expected that people become less and less intimidated by hills and distance as they put the rides in on the ElliptiGO. Most people will progress their fitness faster using the ElliptiGO than they can if they chose running or conventional road cycling. This is simply because of the more natural ergonomics and the lack of contact-point conditioning needed to get moving on the ElliptiGO. And your observations are spot-on. Weight loss is largely determined by what, how and how much you eat – and the benefits of exercise are solely related to your consistency over the long term (so being sure to get in those rides with the same commitment and regularity as having a bath or brushing your teeth is really the only way forward). I feel comfortable that you understand what sort of riding you have to do now Paul – and you have the necessary competence to get the most out of the bike. But my biggest piece of advice at this point is that you set some concrete and meaningful goals to which you can PUBLICLY commit. By this I mean setting ambitious goals – relating directly to your current health challenges – and then achieving them. What is a meaningful goal? The popular business and personal development acronym applies here, in that a goal has to be a SMART goal (Specific, Measurable, Achievable, Realistic & Time-related). If a goal does not meet these criteria, it’s not really a goal, it’s more of a statement. At this point, it is also important for me to mention that I do not personally believe in the common interpretation of that ‘SMART’ acronym. In my experiences of helping people with their training, health & fitness goals, many people who do not already have broad and long-term experience in health and fitness are not in a position to quantify what is “achievable” or what is “realistic”. Those terms are very misleading, in my view, because most inexperienced people will (by far) underestimate what’s possible for the average person to achieve in health and fitness. So I believe that what we really need to seek are specific, measurable, AMBITIOUS, RATIONAL and timed outcomes (still ‘SMART’ – but in a very different way!). The use of terms like “achievable” and “realistic” is where the ‘excuses’ can easily creep in for many people. So rather be ambitious and rational. In practice, that’s almost the exact opposite of those more commonly used terms in the SMART acronym? What do I think is ‘SMART’ for you? I think aiming to reach your ideal body mass index (BMI) by controlled eating and exercise – so that you can potentially reverse your type 2 diabetes condition and avoid the inevitable health decline which comes with living under type 2 diabetes for a prolonged period – is the most important goal you can set yourself at this point. There are no guarantees that the condition can always be reversed, in every person who has it. But, for the majority, a return to an ideal BMI will alleviate the condition, especially if done by cleaning up the diet – and also exercising – so that the body’s response to insulin is completely changed. So your doctor can measure your BMI (or you can calculate it online) then you need to work towards it. Your current ElliptiGO rides cover the exercise aspects quite well and you don’t need to ride further and further (because it has diminishing returns) you just need to ride more consistently (and perhaps to look at riding faster, but over a reduced distance, once each week – to increase your exercise intensity and cardiovascular fitness). Regarding your weight loss goals, I think you are potentially sidelining them in favour of the more enjoyable fitness goals, but the two both need addressing and are EQUALLY important for your health goals. Weight loss needs to be addressed formally, just like the exercise needs to be addressed formally. I strongly recommend joining an ‘accountability group’ to whom you will have to continue to give the sort of feedback you’ve given in making this article. There are many to choose from and they really do work (see Chris’ perfect example of using weight loss support groups). It took a lifetime of forming bad habits to get you to where you are now and it is not likely you’ll resolve it all on your own (or else you’d probably not have reached the current situation). So why not get expert help and support to set up new lifestyle habits? Weight loss groups are not costly, but they give you the same accountability as having training buddies on the bike. It is a two-pronged challenge that you face – getting fit and losing weight – they are not one and the same thing. But doing only one (and not the other) cannot resolve your health condition. You must excel in both. And in view of the theme of SMART objectives, you need to address both weight loss and fitness goals in a SMART manner. Your last feedback points are great – getting training buddies of a similar standard really will help you with both enjoyment and accountability. Luckily, I know a number of them in your area and I can connect you to them. You’ll find one of the best outcomes of these health and fitness journeys we make is some of the quality friendships we strike up in the process. Some of my most valued friends are my training buddies and I have no doubt the same will be true for you. This is a journey, rather than a destination, so saddle up (sorry, step up?) and enjoy the ride! Very sound advice indeed, and thank you for taking the time for the very in depth review, there’s is nothing I cannot agree with. I think going to a weight loss group is a good idea and will look into this – and of course stepping up the exercise routine. If you know of anyone who would like to buddy up with me that would be great (someone who I am not going to hold up and can improve with me, I would be grateful for the introduction – and it may be motivating for them too). I am looking forward to seeing you on the 26th November for our group ride and if you wanted to meet at my house it would be great to introduce you to my wife (as I have spoken so highly of you she would love to meet the guy who has got me onto this crazy machine)! I have sent out invitations to local ElliptiGO riders whom I know and whom I can confidently recommend. They have started getting back to Paul and planning future training rides! Result! I am really proud of what Paul’s achieved so far. As you can see, I prefer to be quite direct and challenging with my feedback – and Paul just takes in what he needs and gets the job done.